According to Howmanyofme.com there are only 47,413 Garrett’s in the U.S. and statically it’s the 838th most popular name. To compare, there are 310,634 Mike’s in the U.S. and Mike is the 223rd most popular name. It’s quite possible that Peterson BMW houses more Garrett’s per capita than any other work place in Boise. Out of a staff of 31 there are the three employees named Garrett. That’s nearly 10% of the work force! So, we thought it would be fun to learn more about each Garrett. Originally from Concord California, Garrett–like many Californians–came to Idaho to raise a family in 2015. Of course other accoutrements like the outdoors, cost of living and quality of life attracted Garrett and his wife to Boise. 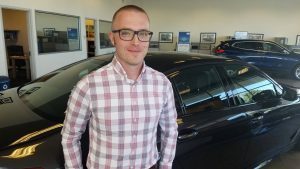 Garrett held the used manager position at BMW of Concord before the store sold to new ownership. “G1” aspired to become a lighting designer as a Theater Major at Westmont College in Santa Barbara, but eventually transitioned to Business Project Management, where he earned a degree from Colorado State University. 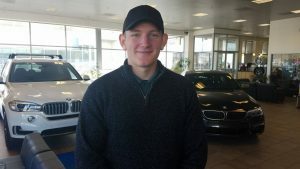 This Garrett loves the day-to-day variety of the automotive industry and cites a recent example of helping an ill customer find the car of her dreams–a BMW Z4. He finally located the very specific Z4 in Florida much to her delight. Though a cliche, he loves helping people find their dream cars. Beshey grew up in Chino Hills, California and was most recently in Yelapa, Mexico helping his Dad run an online advertising business. What’s interesting about Yelapa that there are four founding families that own the land in the small coastal town. The Beshey’s, are an old family friend of one of the founding families, which is required to purchase a home there. Garrett has roots in Idaho though which is what brought him here seven months ago. His grandma is from Boise with deep ties to farming and ranching. “G2” has a passion for cars and loves people so going to work at Peterson BMW as a consultant is a natural fit. “I’m a big family guy which is why I love this community so much. I’m just ready to help” said Garrett. Born in California (sensing a trend here?) “G3” has been in Idaho the past 20 years so he considers himself an Idahoan. The 1989 earthquakes are what prompted his family to move to Boise back then. 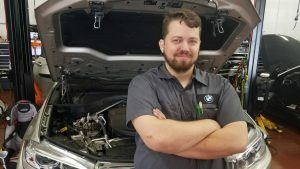 Garrett was a manager at a national sign company for several years but as a self described “Car Geek” he decided to go back to school at CWI to pursue his passion. He graduated with an emphasis in electrical diagnosis and automatic transmissions. When he’s not putting life back in BMW’s he’s traveling internationally with recent trips to Barcelona, Japan, Vietnam, Hong Kong and Bangkok. If you’re ever at our BMW store, just yell “Garrett!” The odds are good you’ll find one.